Stored in the Secure & Alarmed Warehouse, With Roof Cover. Long Term Rate for Your Own Personal Lock Up Garage. The Affordable Rates Shown are For A Standard Car Size. A Small Car, Family Sedan, 4WD, Station Wagon or Ute Are Considered Standard Car Sizes. 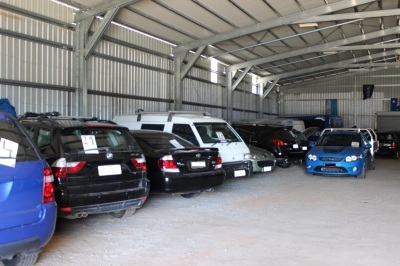 At $25p/w this is our cheapest option for Car Storage. But just because it's the cheapest, it does not mean it is not as safe and secure. The Storage Yard is fully fenced with Barbed Wire, has Limited Access, Security Alarms, CCTVs and On-site Caretakers. This option is best if you do not mind no roof cover. This option is only $35p/w and the most popular option with our new and repeat customers! They enjoy the peace of mind with all the secure and safe features of the yard option but with a solid roof. Some storage places have shade cloth as their "roof" option, but we like to make sure your vehicle is fully out of the weather. Once you book online or contact us to make your reservation, just bring your car to the depot location. We can call you a taxi, and while we wait, if you haven't already, we just need you to fill out our storage form. Then you're on the way to where ever you need to go! Most people are off to the airport. We know travel is stressful thus, we try our best to provide the easiest storage solution. Then your car is locked away until you come back. If you haven't provided an arrive date and time, it is ESSENTIAL to call or email 24 hours before your arrival! So there is no fuss and your vehicle is ready for you to drive away!